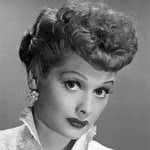 It's Lucille Ball's 100th birthday today and I really don't have anything planned for it. Several months ago I posted a "Thursday Comics" featuring some Lucy comics so feel free to check those out. There is a new post over at the DCR with a couple comics and a LAMNB post should be up later today.